THE SUBJECT MATTER OF THIS PICTURE suggests that it was almost certainly painted in Denmark during those months when Gauguin made his painful and futile attempt to live with his wife's family in Copenhagen. For al¬though it is called a still life, and in size its foregound motif looms large, it is the handling of the interior which gives the picture its particular quality. Gauguin at this stage in his evolution was still very much of an Impres¬sionist, although we know from a remarkable letter that he was already germinating ideas that were to lead to the future. This however is anything but an Impressionist painting. The still life, very close up in the immediate foreground, is seen from above. The family group in the back is viewed in silhouette, against another source of light, specific and dramatic in its effect, and opposed to the neutral and conventional foreground illumination: double perspective and double light source. It is a strange and contradictory invention. The group of women is close knit, closed in, held by the confining walls of the room. It is seen as a total, unified symbol, drawn together as by some invisible force that allows no freedom, instead of the momentary collection of laughing people that Renoir loved to paint, individuals who can disperse as freely as they have gathered. We are reminded rather of the early pictures of Munch and Ensor, which show us even more somber and more stifling interiors of the north, or of the first works of Edouard Vuillard, done less than a decade later, which are described as "intimist." 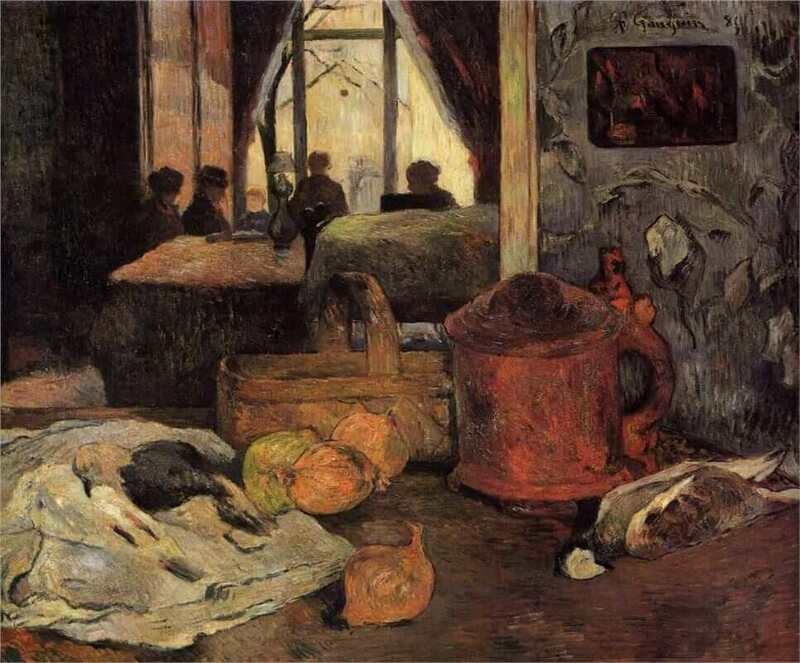 Only Vuillard loved the intimacy of his mother's house, while Gauguin, a bohemian in a bour¬geois china-shop, and a stranger to boot, could not suffer its moral and emotional rigidity, and fled.